Here we’re looking at the gains of the S&P 500 stock index, which broadly represents US stocks. The peaks and troughs in the index for the past 30 years along with the gains and losses for each of the bull markets and bear markets in between these peaks and troughs are identified. What is clear about stocks from looking at this chart is that they move in cycles. We don’t know how long these cycles might last or what precisely might cause them to change, but inevitably, after a period of good comes a period of bad. 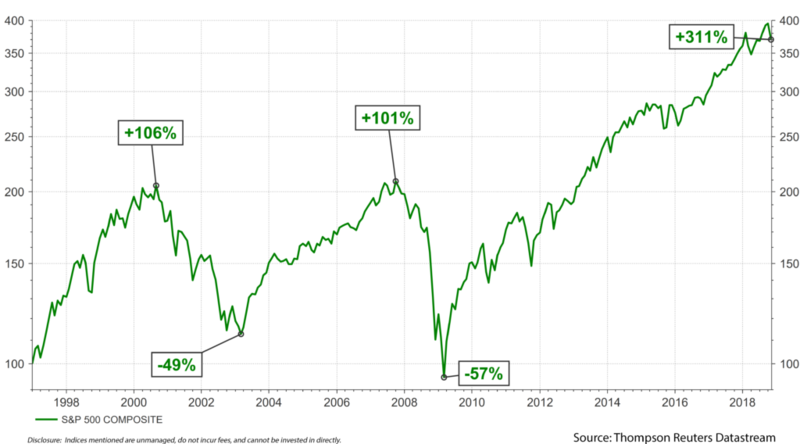 As a bull market unfolds, it can be easy to tell yourself, “So far, so good!” after each successive year of gains. In fact, it gets easier and easier to tell yourself that the more years that have gone by. However, this is not a strategy. Simply assuming that since nothing bad has happened so far, that nothing bad will happen in the future does not often end well. Vin’s joke in The Magnificent Seven doesn’t say how things end for the guy falling off the building and it doesn’t have to. We know how it ends. None of this is to say that stocks are going to crash tomorrow (there is expression which says that bull markets never die of old age). However, it is to say that you should always have a plan for dealing with the things that are inevitable. We know stocks will go down at some point and we should be prepared. There are lots of ways to do this and that discussion is beyond the scope of this post. For now I am just hoping to get people to change their thinking from “So far, so good,” to something more like, “hmm, I wonder when this will end and what that looks like for me.” It isn’t as easy or as catchy, but it might help you land on your feet. Securities offered through Cambridge Investment Research, Inc., a Broker/Dealer, Member FINRA/SIPC. Investment Advisor Representative, Cambridge Investment Research Advisors, Inc., a Registered Investment Advisor. Cambridge and NelsonCorp Wealth Management are not affiliated. This communication is strictly intended for individuals residing in the states of AK, AL, AR, AZ, CA, CO, FL, GA, HI, IA, IL, IN, KS, KY, LA, MA, MD, ME, MI, MN, MO, MS, NC, ND, NE, NH, NM, NV, NY, OH, OK, OR, PA, RI, SC, SD, TX, UT, VA, WA, WI. No offers may be made or accepted from any resident outside the specific states referenced. The information being provided is strictly as a courtesy. When you link to any of these websites provided herein, NelsonCorp Wealth Management makes no representation as to the completeness or accuracy of information provided at these sites. Nor is the company liable for any direct or indirect technical or system issues or any consequences arising out of your access to or your use of third-party technologies, sites, information, and programs made available through this site.